There’s no doubt that Americans are cat people. According to the American Pet Products Asociation’s 2017 National Pet Owners Survey, there are an estimated 94.2 million pet cats in 38% of American households. With this many furry felines a part of our families, it’s more important than ever to keep them healthy and happy! Unfortunately, many cats owners know that compared to their canine counterparts, it can be downright difficult and stressful (for both cat and owner!) to get their pet to the vet. But whether it is for an annual exam or a special visit, routine preventative healthcare is essential for cats to live long and healthy lives. The staff at Leesburg Veterinary Hospital understand this and are dedicated to ensuring our feline friends get the very best care. To demonstrate this dedication, we recently implemented the Cat Friendly Practice (CFP) program. You may recall that many of our staff members became Fear Free certified earlier this year. 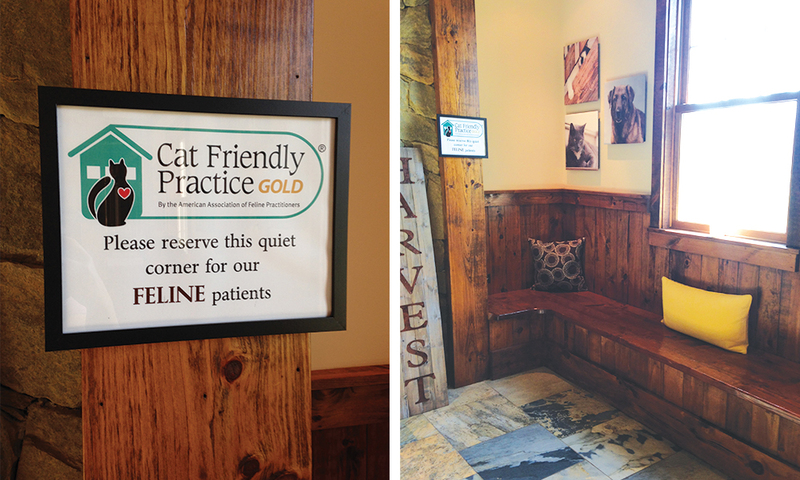 Becoming a Cat Friendly Practice expands upon our commitment to create the most positive veterinary experience for pets and their family. Pioneered by The American Association of Feline Practitioners, the CFP program provides a framework for creating a pleasant practice environment for cats. 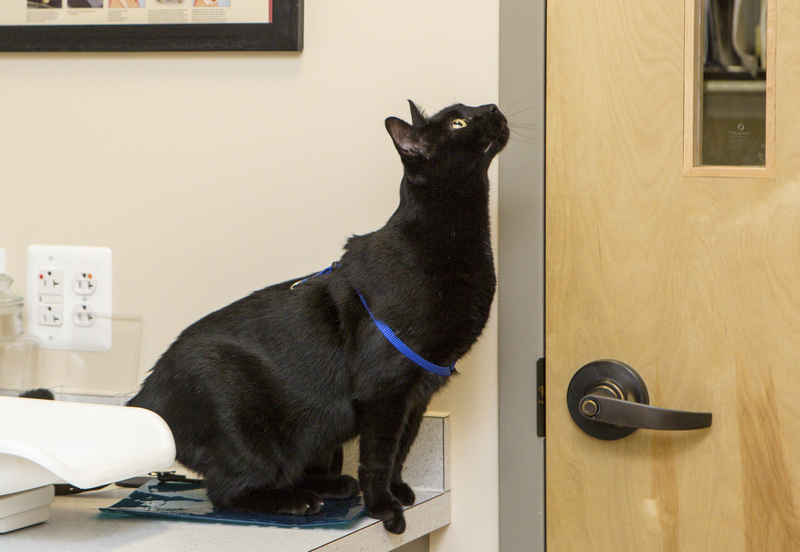 This includes medical care that supports cats’ unique health needs, and knowledgeable staff members trained to understand feline-specific behavioral cues and feline-friendly handling techniques. Cats are most comfortable with the familiar and the need to adjust to new surroundings and experiences. The visit to the veterinarian is often difficult because the carrier, car, and veterinary hospital are usually unfamiliar. Our spacious lobby with large, walled bays was originally designed to keep pets separated and close to their owners; we’ve gone a step further by designating several bays as feline-only. This area is furthest from the entrance and check-in area and quieter than other parts of the lobby. Cats are macrosmatic – their sensitive sense of smell drives many of their behavioral responses. While waiting, we recommend placing the carrier on the seat next you instead of on the floor where your cat is more likely to come into contact with smells from other pets. Our Client Care Specialists may offer your cat a pheromone-infused towel to drape over the carrier. Synthetic pheromone products like Feliway speak to your pet’s sense of smell and act as natural calming agents. Pheromones are compounds that are naturally secreted by animals so that they can communicate with members of the same species, generally to help them feel safe and secure. 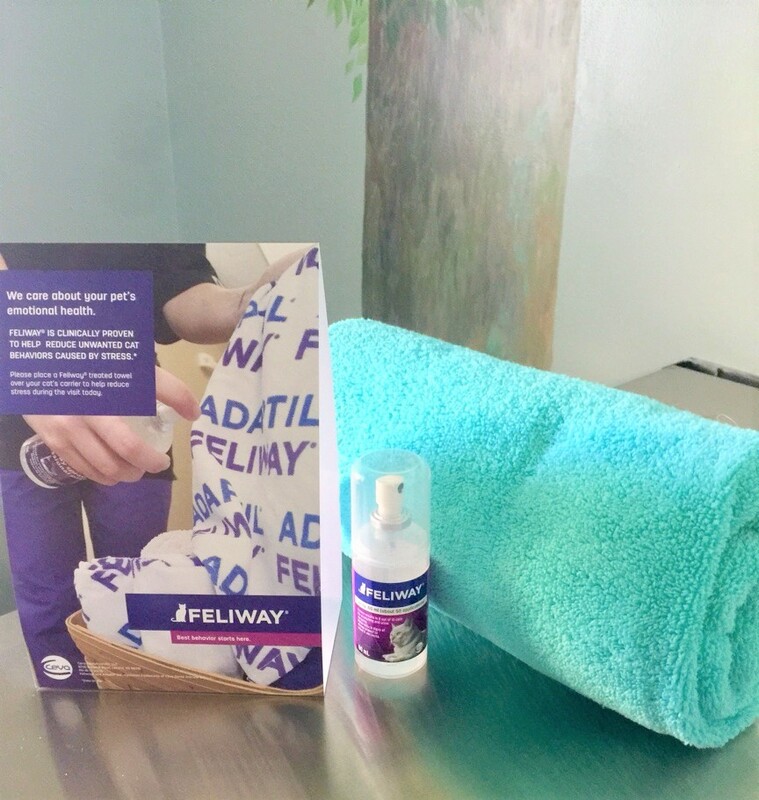 Clinically-proven synthetic pheromones like Feliway mimics cat’s natural pheromones, helping to reduce stress and anxiety in unfamiliar environments. 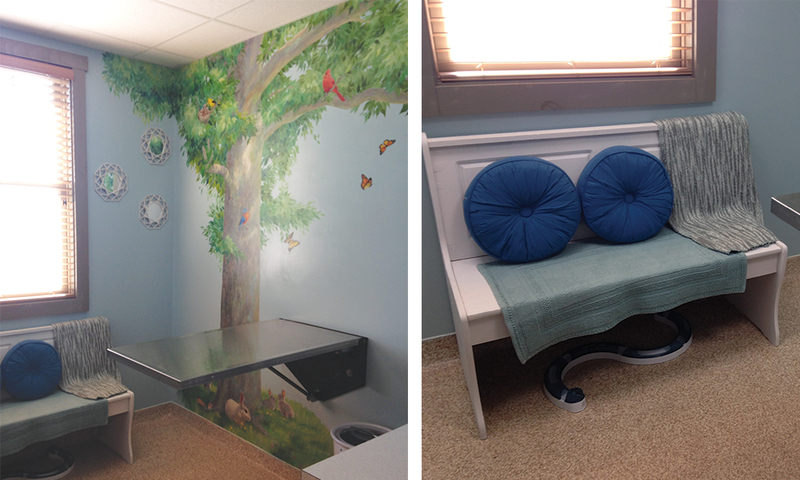 We are so excited to have a beautiful new exam room for cats only. 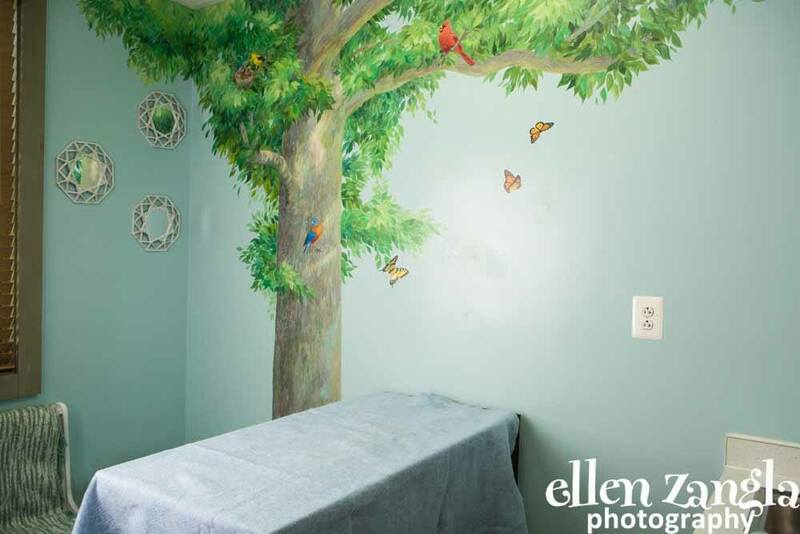 With the help of several of our employees and this amazing mural by our friend and local artist, Penny Hauffe, our feline patients can feel relaxed and safe. 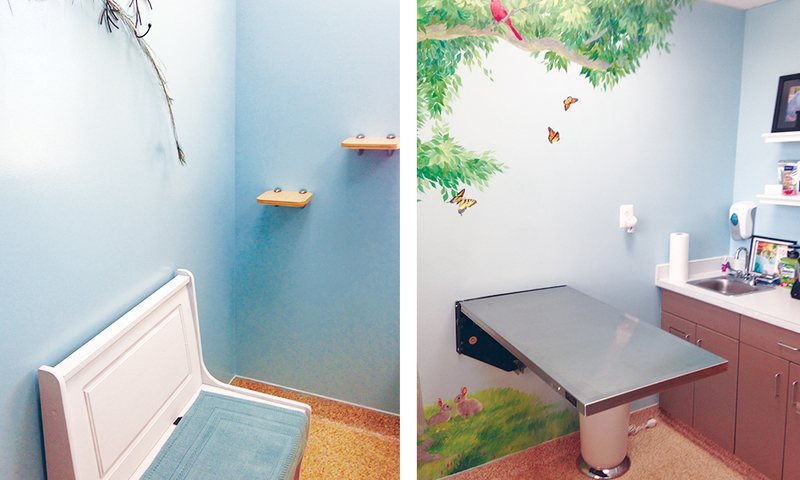 Soothing visuals, soft surfaces, low music, cat-friendly hiding spots and perches, and lots of treats provide a welcoming environment for our feline friends. Cats respond to environmental changes differently. Our staff has been trained in a variety of techniques for each procedure. We will modify our handling and examination techniques to correspond with your cat’s body language and stress signals and conduct the exam wherever the cat is most comfortable. Others may want to roam around on the scale, the floor, or up on the counters. 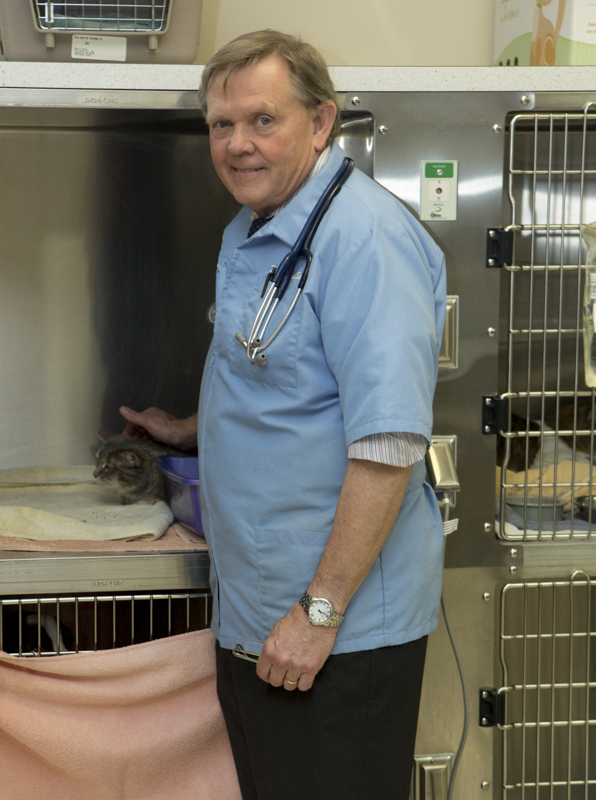 Besides the new cat room, we’ve also made changes to other areas of the practice, including the treatment areas, hospitalization ward, and updates to feline equipment, tools, and procedures. 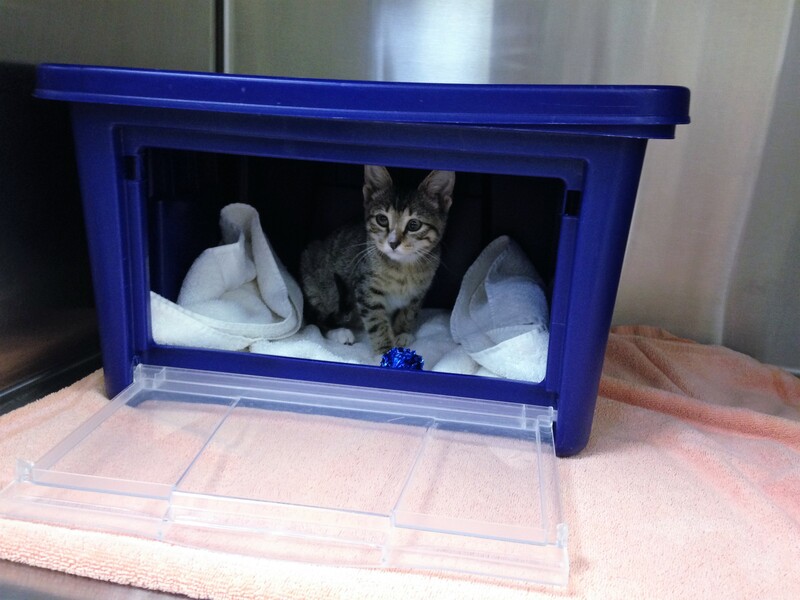 An example of this are hideaway boxes placed in the cat kennels that give kitties another place to feel safe and secure in an unfamilar environment. 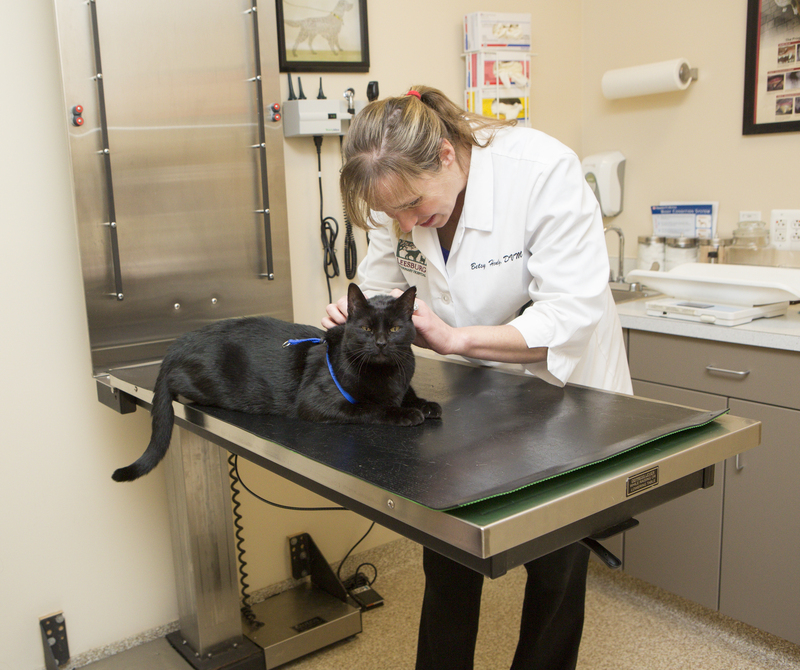 The doctors and staff at Leesburg Veterinary Hospital are committed to creating the most positive veterinary experience for you and your cats. For more information on Cat Friendly Practices and how you can help reduce stress before, during, and after vet visits, visit catfriendly.com. We hope to see and your feline friends soon!